Gmail - CIS 4372 HCI and Data Viz. 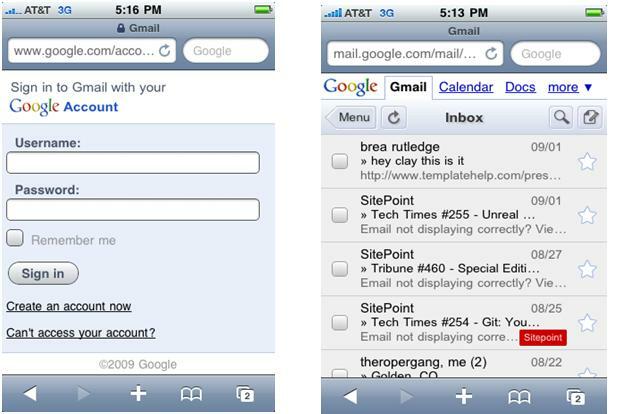 Gmail is the cross-browser web connection to the email services offered through Google. It is a collaborative system built to provide the user the basics needed for email communication. The interface does not require a great deal of long-term memory or time to learn and while a help page is provided for new users, previous knowledge of the principles of email service is all that is required to function within the interface. The interface is simple and designed to accommodate the greatest range of users excluding only small children. It has the ability to facilitate internationalization and can be set to use many different languages. 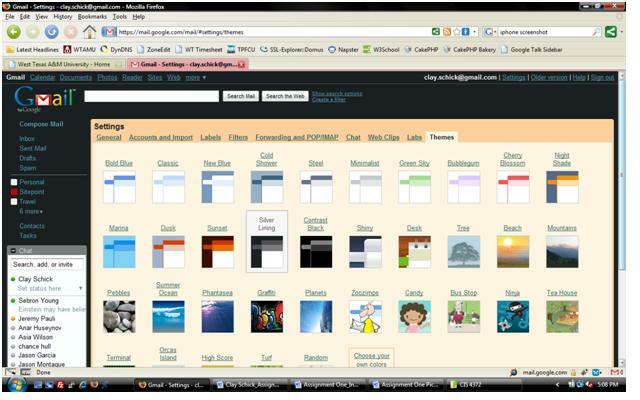 The appearance of the interface can be changed to suit different personalities through the use of themes. When viewed from a handheld device the interface is resized to allow for the greatest amount of functionality but leaves off unnecessary features to control readability. When is handheld mode only a limited number of messages are displayed with the option to display more if needed in order to accommodate the lower bandwidth cellular signal. 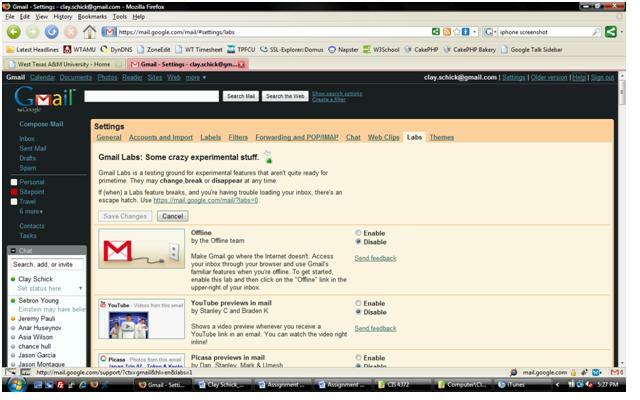 The power user is taken into account through the use of Gmail “Labs” which consists of experimental features that can be enabled or disabled to provide greater functionality within the interface. The only usability measure that is missing is the ability to adjust settings for disabled users. Is consistent 5 Gmail's interface is very consistent. As the user navigates through their emails and various other pages, there is always a banner on the top and left side of the page that provides links back to all email folders and also a search box that allows the user to search through their emails with keywords. 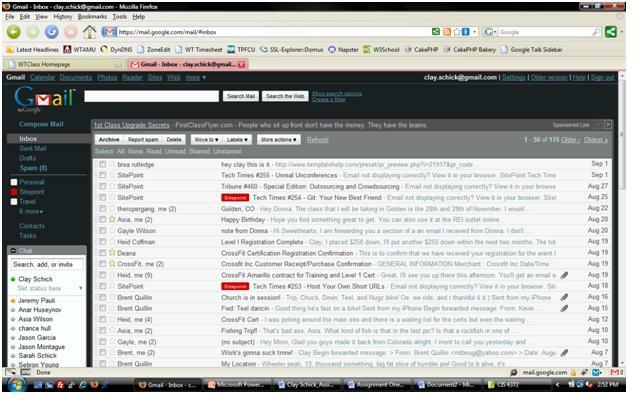 Caters to universal usability 5 Gmail seems to be a very user friendly application. It has a clean/basic look at first but can be customized with various themes and other options. The default settings are great for the average user but they are also given the option to modify these settings giving them more control and usability. Offers informative feedback 4 This application gives good feedback when something is not saved, such as a new email or a changed setting, and the user attempts to navigate away from the page. However, I don’t think there is enough notification when a successful task is completed. There is only a small dialog box displayed at the top of the page to notify the user that the email was sent or the setting was saved. Provides dialogs that yield closure 5 When a set of events is completed successfully Gmail does give the user a small notification that the task was completed or a reason why it could not be completed. This allows the user to close various parts of the application without worrying that something might not be saved. Prevents errors 5 Errors within Gmail itself are rare, but it is accessed via a web browser where errors are probably more likely to occur. Permits easy reversal of actions 4 Gmail does give a user the option to undo if an email is moved to the trash but not if the trash is accidently emptied or a setting is changed and saved. Offers support for internal locus of control 5 Gmail gives the user several settings and customizations that allows the user to access additional features and create a unique interface. This feature seems to be very well developed and useful to the users who want a little more control. Reduces short-term memory load 4 Gmail's simple interface, well-defined labels, contact list, and search feature greatly reduces the users short-term memory load. Once signing in a user can navigate through nearly all of the applications features with virtually no knowledge of the application.